That's wicked!!! I just laughed so hard it hurt! ouch! i saw a movie when i was young with a leper colony and i found it fascinating! You have a very unusal and humourous mind!!! it's the thought that counts! some is better than none me thinks! wicked and clever as usual! OK, that's twisted... and clever!!! LOL! Ewww! Even the bird cracks me up. Gruesome and wickidly funny all rolled into one! Poor lepers. 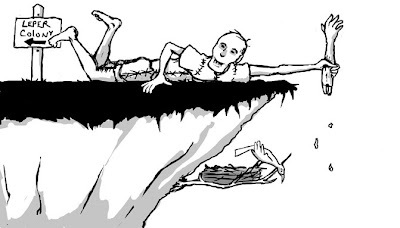 Not only are they social pariahs, they're also forced to live and frolic near perilous cliffs. Well done. I particularly like that poor man's hand-stitched clothes. Brian! You cartooning devil! Great! Sooo creepy! And soooo funny! This is great. oh so nice!!! LUV severed body parts!! Very funny! I like your sense of humor.